In mid-1645, as the Hongguang court of the Southern Ming dynasty crumbled into dust, Wu Weiye (Meicun, 1609–1672) took refuge with his whole family in Lake Fanqing, Changzhou. After two long, worrisome months, the Wu family returned home. In late spring of the succeeding year (Shunzhi 3, 1646), Wu wrote “Pipa xing” (Song of the Lute). Composed in Wu’s celebrated “Meicun Style,” this narrative, lyrical and figurative poem in ballad form has been lauded as one of Wu’s most important and successful poems. 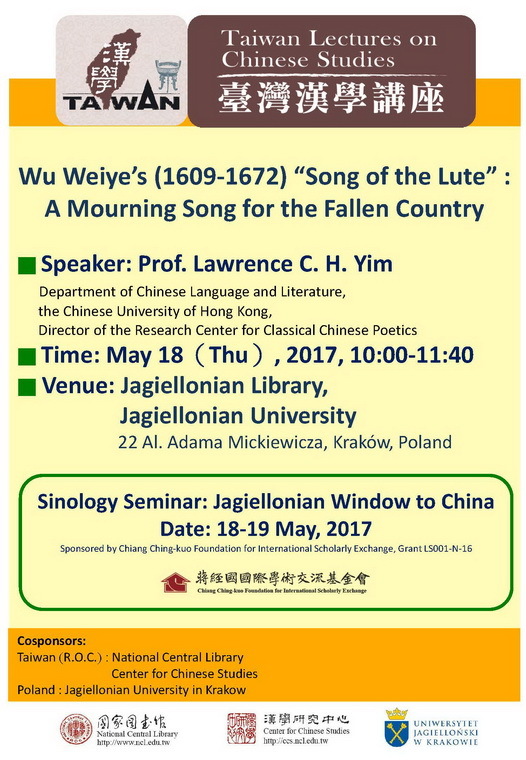 An engaging performance of the lute in a spring evening moved Wu to tears and to write “Song of the Lute,” which tells the sad story of the last emperor, Chongzhen, of the Ming dynasty. “Song of the Lute” is regarded as shishi (poetic history), infused with historical trauma. Much attention has been paid to the relationship between Wu’s poem and the one bearing the same title by his predecessor, the Tang poet Bai Juyi. While this is enlightening, there are other aspects of Wu’s poem that merit further examination. This talk argues that the first and the last sections of Wu’s poem consist of a nuanced dialogue in which the doomed fate of the late Ming is played out in terms of the differences between the Southern and Northern cultures. Here in the poem, Wu muses on the music, culture, and living style of late-Ming Jiangnan, which are regrettably seen as elements contributing to the demise of the Ming house. “Song of the Lute” tenderly expresses a sense of self-criticism, and can be considered as a confession of guilt. Professor Lawrence Yim is an acclaimed authority on Chinese poetry of the late imperial period (Ming-Qing) with research and teaching strengths in a broad range of genres and periods. His books include: The Poet-historian Qian Qianyi (Routledge, 2009), Qian Qianyi “Bingta xiaohan zayong” lunxi 錢謙益〈病榻消寒雜咏〉論釋 (A Study of Qian Qianyi’s “Forty-six Miscellaneous Poems to Dispel Cold on My Sickbed”) (Linking, 2012), and Qiuliu de shijie—Wang Shizhen yu Qingchu shitan ceyi 秋柳的世界——王士禛與清初詩壇側議 (The Poetic World of Autumn Willows: Wang Shizhen and Early Qing Poetry) (HKU Press, 2013). Professor Yim is currently Professor of Chinese Literature, Department of Chinese Language and Literature, the Chinese University of Hong Kong, and Director of the Research Centre for Classical Chinese Poetics at the same University. He was formerly Research Fellow of Academia Sinica and Professor of National Tsing Hua University in Taiwan.